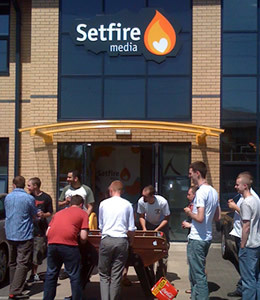 Last Thursday we celebrated a year since the launch of Setfire Media. It’s been a great year for Setfire, with some major product launches, new staff and some important projects making big strides forward. We’ve expanded to take over both floors of our office and have the strongest team we’ve ever seen! Thanks to our team and our clients for making this a cracking year. nice! tf was fun, despite my pitiful speed / aggression in comparison of the more seasoned professionals at setfire.